I was on the phone with my friend Linda, aka LGuild, the other night and she got to talking about the card on the front of of this month's Cards magazine and how simple it would be to make. Well she and I both decided to try it out! It was very simple to make and was fast too! I knew I had some wide ribbon that I could use for this, but the problem was trying to find ribbon and flowers that matched. I didn't have enough of the exact same flowers to complete 4 cards but I still think the ones I used worked out nicely. The patterned paper is K & Company and is cut at about 3.5 inches I think. The ribbon is 1.5" wide grosgrain, and are tied to scrunch it underneath the flower. I didn't wrap the ribbon around the whole card, instead I tucked it under the patterned paper *okie thinks she might be just too darn cheap sometimes*. The flowers are Petaloo's. I used a white Signo gel pen for the faux stitching *that reminds okie that she needs to order a box of pens since she and Linda, aka Lguild, are both running low on the pens*. The sentiment is computer generated on Microsoft Word. I cut the sentiment strip at 3.75" x .75" and then added a two Queen and Company pearls to give the illusion that is what is holding the sentiment on there. Here you can see a little more close up of the cards. 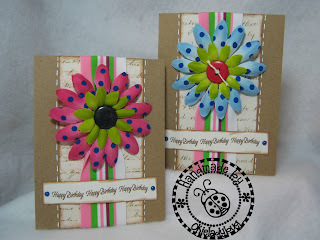 On these two I used buttons for the flower centers. One was a hole button and I tied twine in the center. The other was a post button and I broke the post off with a pair of pliers so it wouldn't stand up and would adhere a little better. I use this method quite a bit because there are some great post buttons but the posts get in the way. I just used Glue Dots to adhere the buttons to the centers. These cards went together really quick once I found what supplies I wanted to use. I could have cut flowers using the Cricut but since I had these I thought they would look nice. Oh and I would just like to mention that when Linda, aka LGuild, came to my house she took some of my wide ribbon! SHE IS A THIEF!! *okie puts on a helmet because she knows Linda, aka LGuild is gonna bonk her on the head for that one* Okay okay I will tell the truth. Actually I told her to go through my ribbon box and take what she wanted and just to send back what she didn't use. She didn't want to take it but she did pick some out. I can't wait to see what she makes with it! GUESS WHAT! LINDA, AKA LGUILD, HAS A BLOG NOW!! She started her own blog so she can post what she makes. Go check her out at Nothin' Fancy! She has her Ribbon Flower cards. These are so pretty! I've got to go back and look at that cover. TFS how easy they are to make. Ribbon. Ribbon, she says. RIBBON!!!!! Don't talk to me about some dern ribbon, Okie! 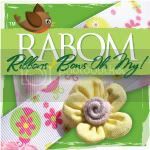 You enabled me into enough RABOM ribbon last week to go up and down the length of a NFL regulation-sized football field 8 TIMES!!! I still can't believe how crazy I went! It's not nice to call names Okie! I don't know how poor Linda puts up with you! Love these cards. So pretty. I never buy wide ribbon because I didn't know what to use it for. Now I do. Thanks. I love this card!! I am a big fan of flowers on cards. Thanks for sharing! I love these. Very cute. You are getting consistent with your posts. Thanks for that! Cute cute cards. And your instructions are great. Does Linda have a blog? Just wanted to see what see comes up with. Diana, Linda doesn't have a blog, she is too lazy to get one! HA HA HA Actually if she sees your message she will probably send me pics if she knows people want to see her cards. Matter of fact I will email her now and tell her to get me some dang pictures. Melissa-----YOU HAVE NO IDEA! LOL! Diana-----I don't have a blog. Am not savvy enough to operate one! And if I had one it would probably be so "vanilla" that no one would ever look at it! Even though we both lifted the idea for the card from the same source, ours look very different. I'm more of a plain Jane and Okie luvs her embellies! 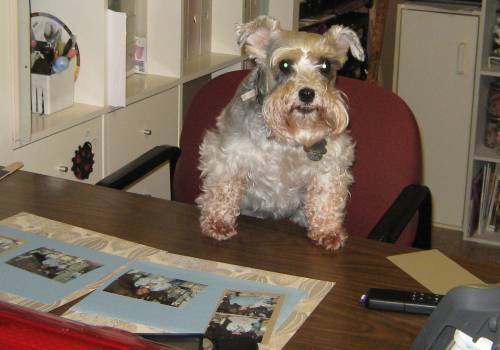 One of these days I may have to get Okie to give me a blog lesson. The Cricut MB is going to change the way you post photos and I'd just as soon not have to struggle to post them on there. And, I'm one of the main complainers about people posting there and saying "if you want to see the photo go to my blog at such and such" ! 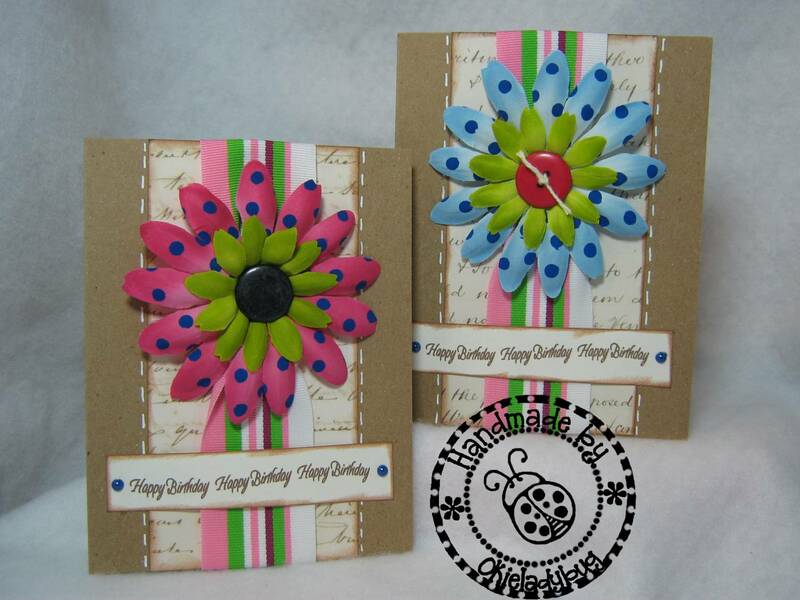 Beautiful cards, love the ribbon and flower color! I love these! I have some really wide ribbon and have been trying to figure out how to use it. I think I will give this a try! Thanks for another great idea! I love these cards!! So simple, and soooo pretty! They would be a great gift bundled up for the non-crafters (crafters would appreciate them too, but we can always make our own!) Thanks for sharing! Okie, you are so talented! 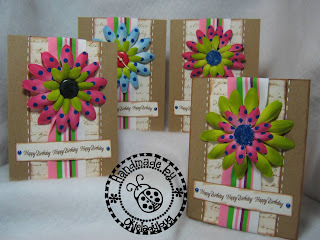 I love these cards and once again your blog makes me want to run to my craft room and get busy. Okie shamed me into making my own blog. I won't go into how I described making a blog to Okie this afternoon, let's just say I fumbled around until I got close to where I needed to be! I posted two photos of the cards I did similar to Okie's. Here is the link, please don't expect too much. I told you it would be very "vanilla". As soon as I can corral Okie into it I'm sure she'll show me how to jazz the appearance of it up a notch. My blog is called Nothin' Fancy--and the name says it all! 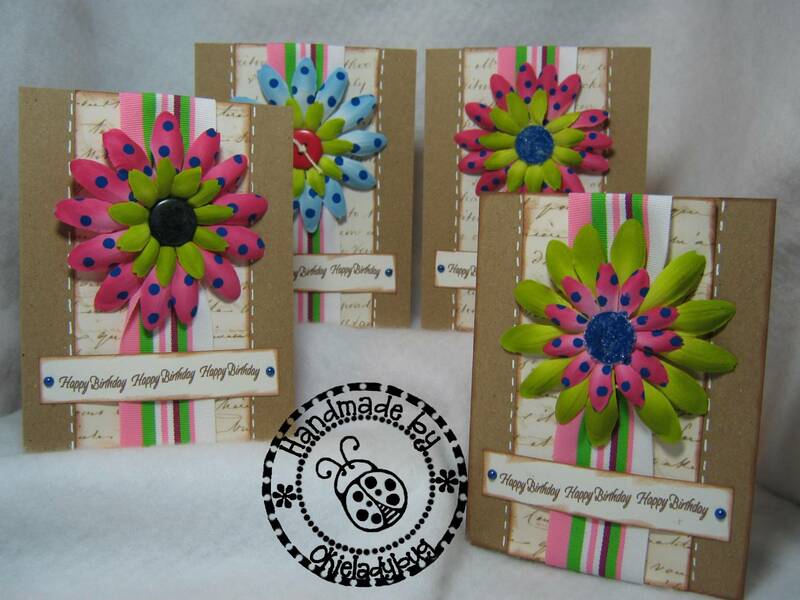 These are sooo pretty...I am now a follower of Linda's can't wait to see what she makes with your ribbon lol...TFS! Love these cards! 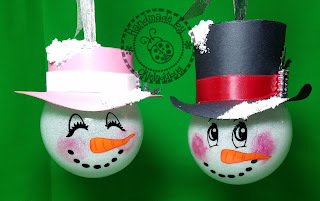 !Maybe I could even make them!! This Simple Ribbon Card was so cute. I love it. I also make gift cards specially if there's an occasion. Anyway, i enjoyed reading this post. Keep posting. These are great cards! What a nice set they would be to give to someone. I may have to try a version as well. Lovely cards it simply beautiful I like it so much. Will certainly visit your site more often now.